It may be "America&apos;s Walking City," but Boston also features an extensive transportation system to help you navigate smoothly, from Harvard to the Harbor. Use this section to plan your trip in advance and when you&apos;re in town. 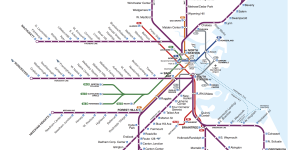 Boston&apos;s public transportation system is operated by the Massachusetts Bay Transportation Authority, but locals know it simply as the "T". It offers subway, bus, trolley car and boat service to just about everywhere in the Greater Boston area and beyond. 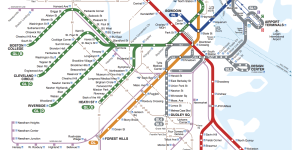 Subway stops are color coded - Red Line, Green Line, Blue Line, Orange Line or Silver Line. To ride the T, you need to purchase a CharlieCard or CharlieTicket. These can be purchased at most subway stations at vending machines and at select convenience stores. The basic fare is $2.75 with a CharlieTicket or $2.25 if you have a Charlie Card. Kids 11 years and younger ride free! And your Charlie Card will provide you with more than 75 discounts on attractions during your visit. The "T&apos;s" LinkPass gives visitors unlimited travel on Subway, Local Bus, Inner Harbor Ferry and Commuter Rail Zone 1A for one day ($12) or seven days ($21.25). More than 500 fare-vending machine are located throughout all subway stations. For specific information on routes and schedules, call the MBTA at 617-222-3200 or visit mbta.com. Information is in several languages and the website offers a very useful "Trip Planner" to get you to your destination. Operated by the Massachusetts Bay Transportation Authority, Boston&apos;s Commuter Rail services the outlying Boston suburbs. Service is available from several T stations, but most departures take place at South Station, North Station or Back Bay Station. Phone: 617.222.3200. Visit the MBTA site for more information. Logan Express stops at all terminals. Bus route time is approximately 20 minutes. Be sure to allow extra time during rush hour periods. BLUEbikes is your bike sharing system providing over 100 stations and 1,000 bikes available in Boston, Brookline, Cambridge, and Somerville. Grab a bike near your hotel and pedal your way to your next attraction, shopping trip, or to visit friends and family. 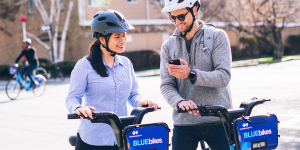 Using BLUEbikes is easy and tailored to fit your needs. Choose between an Annual Membership, Monthly Membership or 24-Hour Pass and access the fleet when you want it, three seasons per year (the system is shut down in the winter). 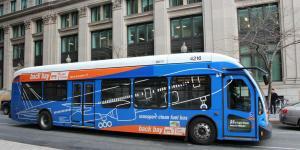 The cost includes unlimited trip(s) less than 30 minutes in duration, longer rides incur additional usage fees. Please review the pricing page for additional information. Don’t want to drag your luggage all over the city? Check out Knock Knock City to store your items in many convenient places around Boston! Knock Knock City offers fully insured luggage storage at only $1/hour. For additional luggage storage options check out Boston Checkers and Vertoe. Outdoor Enthusiast Boston, Massachusetts is a paradise for outdoor enthusiasts! Shopping Day Boston is a shopaholic’s dream!